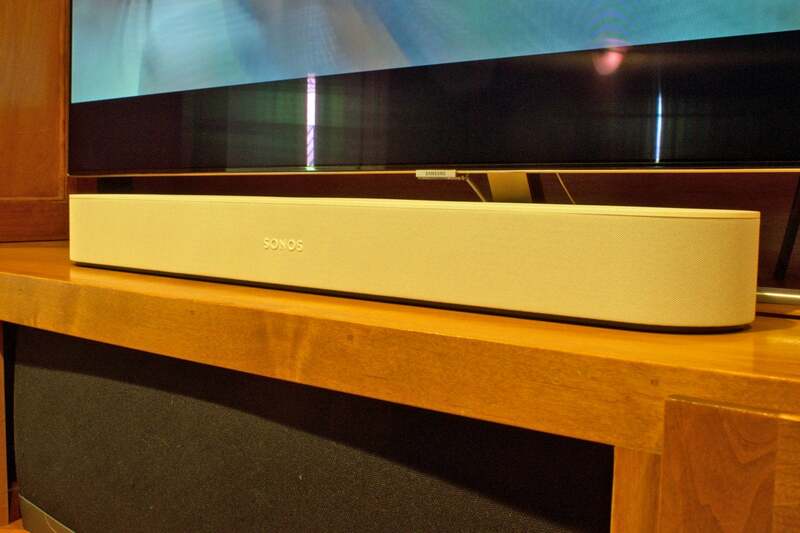 This compact, smart soundbar delivers features galore, just don’t expect it to fill a big room. Measuring just over two feet wide, this soundbar packs four elliptical full-range woofers, three passive radiators, and a single center-mounted tweeter in its 2.7-inch-high enclosure. Each of the five active drivers is powered by a discrete Class D amplifier. It was enough to fill my smallish (247 square feet) home theater with sound, but it took everything the Beam had to do it—there was absolutely nothing left over. The Beam was the ideal height for sitting in front of the 55-inch Samsung quantum-dot Q7F TV I used for my evaluation. If your TV is mounted to the wall, you’ll need to spring for an optional wall-mount kit ($59 for a Sonos mount, or $120 for a fancier one from Flexson). The Beam weighs 6.2 pounds, so it should be easy to hang. 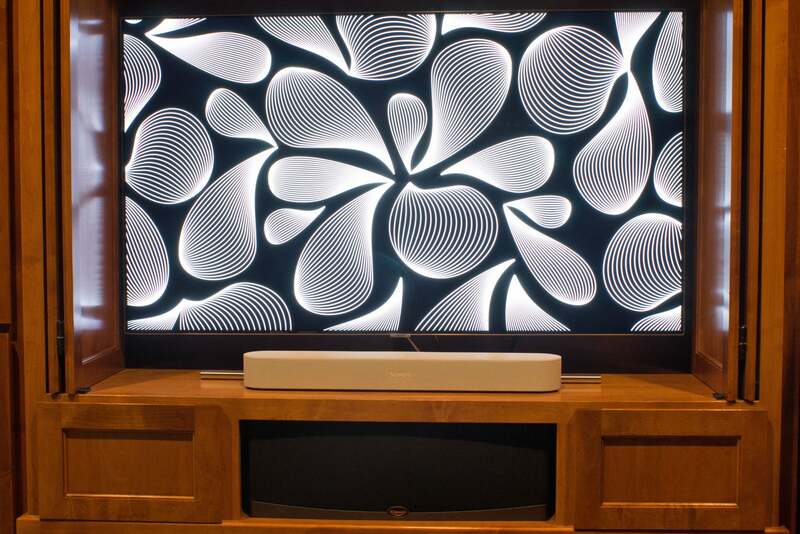 The Sonos Beam displays abstract poster art while streaming music. Sonos assumes buyers will use HDMI to connect the Beam to their TVs (it’s hard to believe this is the first Sonos TV speaker to support the common interface), so they can use voice commands in conjunction with the TV’s CEC feature to control the TV’s basic functions (turn it on and off, adjust the volume, change the TV’s channels, etc.). ARC (audio return channel) support enables the TV to send audio back to the speaker (essential for smart TVs and TVs with over-the-air tuners). Sonos has developed one of the most powerful, yet easiest to use, multi-room audio systems on the market. The Beam’s five-microphone array, mounted in the speaker’s slightly concave top, had a much easier time hearing my commands while playing TV and movie content than it did with music—at least when music was playing loudly. 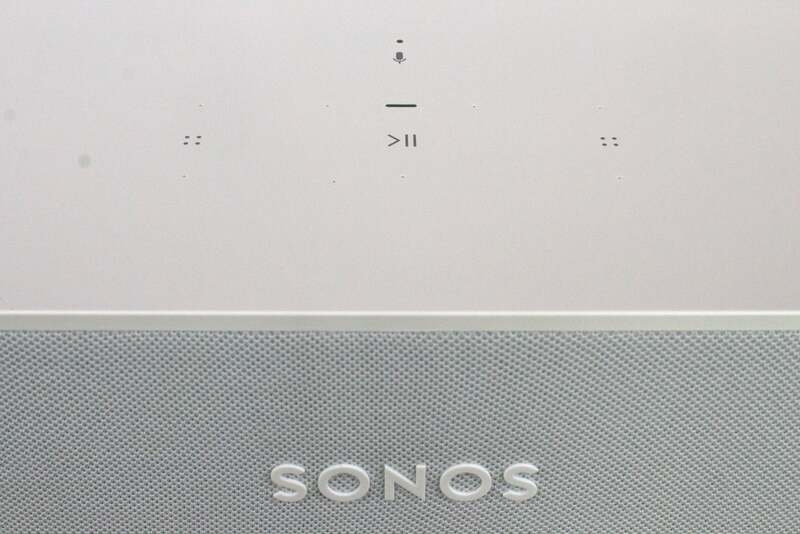 You’ll find yourself using the Sonos app for performing such tasks as grouping Sonos speakers together and queuing up music stored on your own server, versus a streaming service such as Spotify. You can do a lot more with voice commands while watching TV entertainment if you have an Amazon Fire TV device, including pausing video streams. You can also say things like “Alexa, play ‘The Crown,’” and the Fire TV will start streaming the Netflix series by that name. Not having a late-model TV, however, is not a complete obstacle to using the Beam: Sonos wisely puts an HDMI-to-optical adapter in the box. Bass response was the area where the Beam impressed the most. The woofers and passive radiators laid down a solid foundation for both music and movie soundtracks. Low-frequency effects, such as the rumbling engines of the monster trucks in the Ultra HD version of Mad Max: Fury Road, sounded suitably menacing. 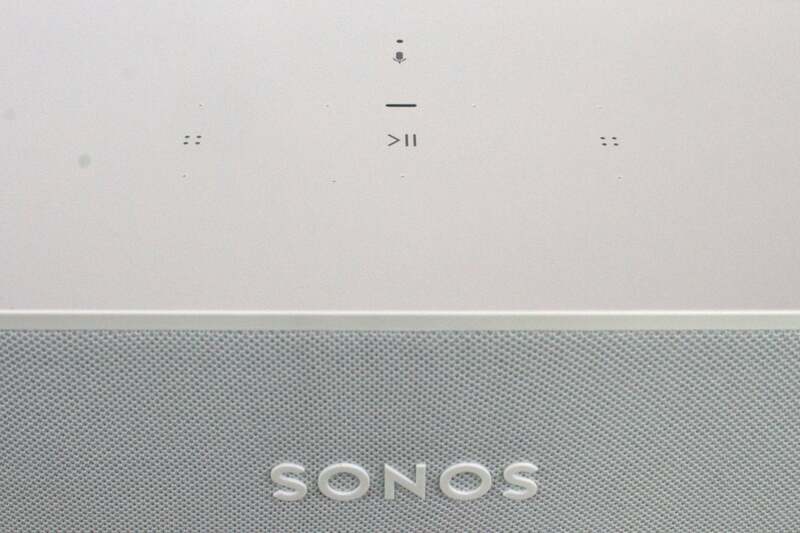 But if you find that it isn’t enough to sate your craving for bottom end, Sonos gives you the option of pairing the Beam with its own wireless subwoofer. And if you want the full 5.1-channel experience, you can add a pair of other Sonos wireless speakers to handle surround-sound duties. But you’ll need to pay to play: The sub will set you back $699, and a pair of Sonos Play:1s (the least-expensive option) costs $298. If you’re dropping almost $1,400 on TV audio, you should consider all your options and mark that nothing in the Sonos product catalog supports immersive-audio formats such as Dolby Atmos or DTS:X. That said, Sonos is offering some limited-time discounts to mark the Beam’s ship date: $50 in savings if you buy a Beam and two Play:1 speakers as a set, $100 in savings you if buy a Beam and a Sub as a set, and $20 in savings if you buy two Sonos One speakers. Touch-sensitive controls on the top of the Beam's cabinet augment its support for voice commands. The presence of a single tweeter, meanwhile, left audio at the other end of the frequency range very slightly muted, a phenomenon that was much more noticeable with music than soundtracks. 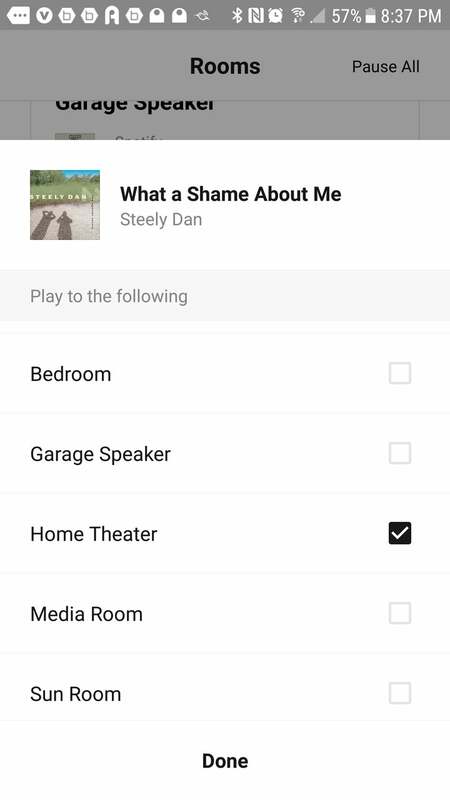 The open high-hat strike that marks the opening of Steely Dan’s “What a Shame About Me,” for example, from the band’s Two Against Nature CD (which I ripped from CD and encoded in FLAC), lacked the high-energy sizzle that I’m accustomed to hearing on higher-end speakers. And there is no Sonos speaker you can add to the Beam that will bring out those highs. But people don’t buy the lower-priced Sonos speakers for critical listening sessions; they buy them to have music all over the house. You can’t play high-resolution audio on Sonos speakers, but no one does multi-room audio better than Sonos, especially when you include smart speakers in the mix. A quick word about Sonos’s Trueplay room-equalization system: It depends on your having an Apple iPhone, iPod, or iPad, but I can’t recommend it highly enough. I wouldn’t buy an iOS device just for Trueplay, but if anyone in your circle of friends is willing to let you borrow one for 10 minutes, take them up on the offer. When I ran Trueplay on an iPad Mini, the speaker performed considerably better. Sonos doesn’t support Trueplay on Android devices, because the diversity of microphones in the universe of makes and models of Android tablets and smartphones is too great. The Sonos Beam is easy to recommend, especially if you’re already invested in the Sonos ecosystem. It delivers plenty of bang for the buck: huge bass response; Alexa support, with Google Assistant support on the way; room equalization via Sonos Trueplay; Apple AirPlay 2 support; and more. It puts out enough volume to satisfy most people—more than you might think possible, given its size. Just don’t expect to perform miracles in larger spaces.